Snickers while promoting “#EataSnickers” has revealed the SBXLIX commercial before the game day with a Facebook Fan page post. The Campaign positions the brand for a complete meal that fills you up, moving it up from just a snack or a chocolate bar. In the teaser released earlier for the commercial, Trejo playing Marcia Brady is shown brushing each side of her hair 100 times. Part of the brand’s “You’re Not You When You’re Hungry” campaign, the hysterical big game spot shows Trejo being enraged after being hit by Peter with a football. Trejo is ready to settle the score when mom gives her a Snickers. One bite and Marcia returns to being sweet and lovable. The teaser released earlier was interesting for viewers to want to know more about the story. 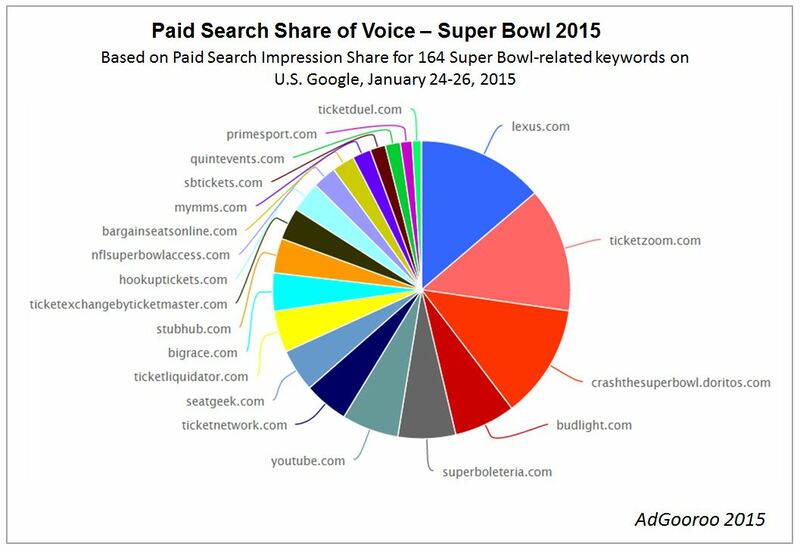 In Paid Search Advertising brands posting video commercial are gaining a share of impressions with YouTube advertising with Keywords linked to Super Bowl. Gaining a 4.5 percent impression share, YouTube’s ads with Google promoting YouTube advertisers during the period included promotions for Pepsi, Toyota Camry, Snickers, McDonald’s and Budweiser. 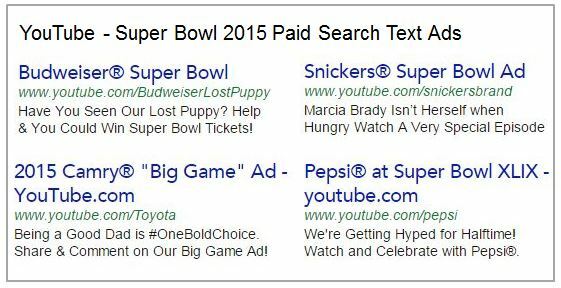 The ad impressions analyzed for Jan 24 – Jan 26 show that brands advertising with Super Bowl keywords are targeting audiences for engagement with the Super Bowl ad spots and videos ahead of the game. Skittles has been advertising the brand as an official sponsor with celebrity endorsement from Seattle Seahawks player Marshawn Lynch in a video produced by Skittles that shows him answering off-the-wall questions during a fake news conference, all while eating his favorite candy. Skittles has rewarded fans with special Skittles Wednesday that won’t be sold in stores. The company gave out dozens of bags of a limited edition Seattle Mix at CenturyLink Field featuring blue and green candies in honor of Lynch and the Seahawks for the second year in a row. A number of them have already shown up on eBay, with one seller offering a bag for USD 500 with an accompanying Skittles headband and eye patches. In addition to social media conversations and engagement, here are some online video advertising tips from BrightRoll, to improve your campaign targeting for Super Bowl keeping the second screen and TV Everywhere phenomenon in mind. Unlike traditional television, online video can be combined with behavioral and audience targeting. Based on TV viewing and internet or device usage, brands can now isolate users most likely to be watching the Super Bowl and serve them the right messaging. Brightroll recommends combining a few different targeting tactics. For example, a strong campaign could combine targeting of past NFL ticket purchasers with online data for ‘Big Game Party’ attendees. Using audience targeting, brands can greatly increase the reach of campaigns without relying on generic run of site placements. You want to reach fans where they live — whether they’re checking the scores or perusing blogs for player updates. Content that makes sense in the context it’s viewed in can mean the difference between a touchdown and a fumble on game day. Buying programmatically — in an automated, software-driven way — can help you cover a wide breadth of second-screen properties without being tied down to just one. Alternatively, a direct deal can allow access to the splashy, high-impact units often associated with the Super Bowl. A private marketplace deal can be a healthy medium between the two. A real-time component to your campaign can help you interact with engaged fans, but don’t push it too hard. Everyone wants that Oreo moment, but with limited time and resources that may be easier said than done. 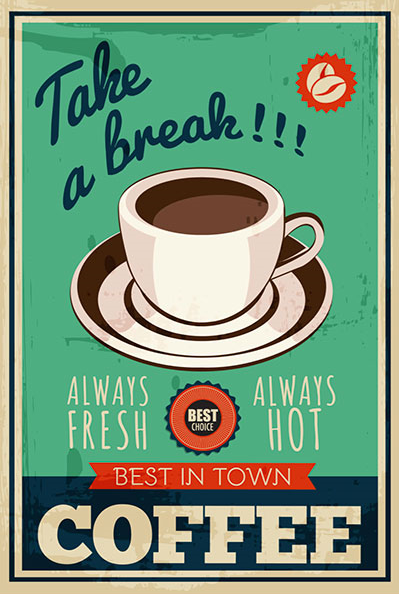 Posted in Advertising, Digital, Social Media. Tagged advertising, Digital, Mobile, Search, Social Media, Video Advertising, YouTube.